The version 3.1.23 of the theme has a loooong list of changes. Most of those updates/improvements are “under the hood”, in other words, you won’t notice them but they contribute to make the theme safer, faster and easier to extend. Of course, the new release of the theme has been successfully tested with WordPress 4.0 as you can see in the Customizr demo site. Most of those changes have showed up when I was building the brand new hooks API reference of the theme, for which I’have had to thoroughly review every single php file of the theme. The new version will be live soon but you can already download it from the WP.org repo : here. I hope this release will help you build an even more awesome web presence, and I look forward to reading your comments/ improvement requests. Note : Some users have reported a broken slider after the update. This can easily be fixed by refreshing your browser cache. Will your user notice anything ? new visitors will never have this problem. Now there’s only one file loaded, gathering all minified files. * improved : (php, class-fire-ressources.php, js : tc-scripts.js ) Performances : tc-scripts.js now includes all front end scripts in one file. 1) Twitter Bootstrap scripts, 2) Holder.js , 3) FancyBox - jQuery Plugin, 4) Retina.js, 5) Customizr scripts. New boolean filters to control each scripts load : tc_load_bootstrap, tc_load_modernizr, tc_load_holderjs, tc_load_customizr_script. 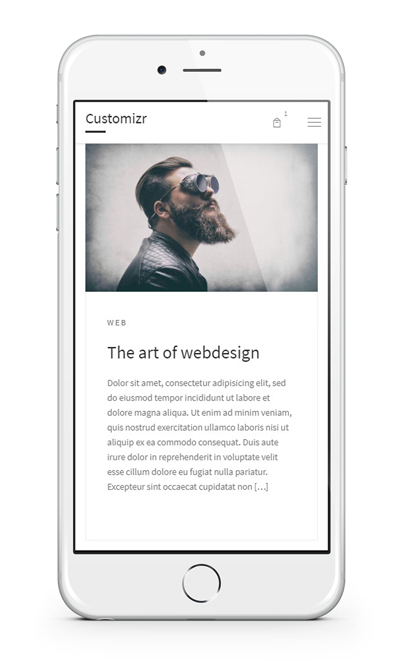 * improved : (php, class-content-featured_pages.php) new holder image style. Foreground color is the main skin color. * updated (js, holder.js) version 2.4 of the script. * added : (php : class-fire-init.php, css) 2 new social networks : tumblr and flickr. * added : (php, class-content-post_metas.php) entry-date meta : new filter to use the modified date instead of the actual post date : 'tc_use_the_post_modified_date'. Default to false. Note : get_the_modified_date() == get_the_date() if the post has never been updated. * added : (php : class-content-slider.php, js : tc-scripts.js, css) Slider : for a better experience, when the re-center option is checked in Appearance > Customizer > Responsive settings, a gif loader is displayed while recentering. * changed : (php, init.php#47) Class loading order. Utils are now loaded before resources. * changed : (php, class-fire-resources.php) localized params filter renamed 'tc_customizr_script_params'. Left and Right sidebars classes are now set dynamically form the global layout params. * added : (php, class-controls.php) 2 new action hooks : __before_setting_control, __after_setting_control, using the setting id as additional parameter. After updating to the latest version here is the error being thrown. Actually realized that the update was the 3.1.24. Thank you so much for such a great theme! Tried many before I found yours, thank you very much! Have a question with regards to ‘FooBox Free Image Lightbox’. The first image clicked always stays there. It is not a problem if the first image clicked is smaller then the rest but if it is bigger, the text becomes very confusing. I tested the ‘Gallery Carousel Without JetPack’ and that works. I am using a Child Theme but the issue is the same with the parent theme. Any idea on how to solve this? Asked on the Plugin site but no answer and I think it really is a theme issue. Hi Nicolas, I noticed that the latest Customizr version utilizes minified .css files. When I inspected the grey.min.css it was of course minified but then i found the grey.css file was also minified. So difficult to edit or to read the code. I thought you might want the .css file to be in an editable format while the minified version would be compacted?.. You are right, the grey.css should not be minified. This will be fixed in the next update. Hi Nicolas, Have been using your theme along with a child theme for over a year. I recently upgraded to WordPress 4 and upgraded your theme at the same time. I soon noticed that the site was not working on my small mobile telephone. The dropdown menu works but the single stacking (into a single column) of sidebars, content etc was not happening. On restoring the old version of the theme the stacking the site fully responsive again. This could be a bug? I am carrying out tests on the site to find the best solution. If i can help please let me know. Hi Andrew, I just answered on the forum. When I go Appearance -> Customize, the live display of the changes I make isn’t loading at all. It’s 100% blank. All I see is the sidebar where I can change Skin, Logo & Favicon, etc. It randomly started displaying blank mid-last month. Secondly, you know that “About Nicolas” box you have at the bottom of this post? How do you access it from WordPress? I don’t know if I’m missing a plug-in or just totally missing something, but I cannot for the life of me access that box. What’s the trick? Thanks for the amazing work! This is the first theme I’ve WANTED to pay for because it is just so outstanding. Cheers! 1) Preview frame is blank : for this problem, make sure you have the latest version of WP (4.0) and Customizr (3.1.24) installed, disable all plugins , refresh your browser cache and see if it fixes the issue. Then try to identify the pluginin conflict. If not solved after all that, please report back. 2) Edit the user’s description in your WP admin > users and it will be displayed. Simple as that! Thank you for the follow up, Nicolas. Issue is consistent and repeatable across all devices and browsers. Again, not a huge bug, but one that will certainly crash a site if the user navigates to the left in the slider nav. Thanks for taking a look at this, Nicolas. And keep up the great work! I can reproduce the bug. It’s a theme problem. This will be fixed in tn the next day in the v3.1.24+. Many thanks for reporting this important bug. That fixed it, Nicolas. Nice job! Thank you for all that you do to make the rest of us look so good. You Rock! Live long and prosper with Customizr! I want to thank you for creating a terrific theme that has allowed me to create my first WP site in just a few short hours. I love the flexibility of the theme, and appreciate the improvements made with the latest update. Since the v3.1.23 update, I discovered a small bug in the customizr slider functionality that I wanted to share. It seems that if you navigate to the left from the first slider image, the slider disappears. If you continue to navigate using the left arrow, the slider will reappear and continue to allow navigating to the left until you reach the first image in the slider series. It will then hang the slider altogether and often hang up the site until the browser window is closed. I have been able to replicate this issue using multiple browsers, devices, and customizr sites – including your own demo site via the link at the top of this page. It appears to be consistent anytime you navigate to the left through the entire list of slider images. I am confident that you will be able to resolve this issue quickly and easily. Just wanted to be sure to put it on the radar for the next update. Thanks again for all you do to support the WP community. Many thanks for this feedback. Hi Minerva, you can do some customizations to your website by adding snippets in the functions.php file of it. For the footer, try to look at those snippetsfor example. Bear in mind, that if you don’t use a child theme, all those customizations will be erased the next time you’ll update the Cutomizr theme. I am not able add or edit the widgets in the left and right columns or footers. The drop-down menus do not work and I am not able to activate the widgets. This started after the WP 4.0 and customizr updates. I appreciate the help to solve this issue. Hi James, I just checked the widgets features : adding, editing, deleting, moving, with Customizr 3.1.23 + WP 4.0 and it worked fine and my website. Could you please try to desactivate all your plugins and see if you are still having this issue? OK Thanks for sharing this information James. I am glad you like the Customizr theme, thanks! Decided to check for a code snippet to use in a child theme, but found out the plug-in for the child theme is broken with the wordpress 4.0 update. I have several plans for the child theme again (this is my second website using customizer!) So that is probably a priority right now for me. I’m a derp. I found the second spot where I could tell it to display the full feed (first one was in the normal settings, the second one in the “customizer” settings). Hi Andrea, I am glad you solved your first issue. In the mean time, I have checked this full/excerpt option and it worked fine. I don’t really get your point for the child theme issue : what do you need to do ? Thanks Nicolas.. The W3 Cache plugin worked perfectly. You have done an Awesome job!! Impressive. Most needed. This update helps greatly in website pages speed. ( another factor of rankings). I have a question please, have you included in this update Errors in Google Structured Data : Error: Missing required field “entry-title”. You told me you already put that into your Do List!! This is still in the to do list, but as you can see there were many others items in the list :-). By the way, recently Google officialy ended its authorship support in the search results, the author structured data are now obsoletes. Updated to 3.1.23 and my homepage slider just gives circling dots – like a waiting beach ball. It worked, but will all my visitors have to do the same thing? 1) new visitors will never have this problem. Did you refresh your browser? Ctrl+F5 worked for me. Is it just me, or the browser I’m on (Safari) or what? The Appearance | Themes | Theme Details -> Update Now, (which links to -> http://[my domain name]/wp-admin/update.php?action=upgrade-theme&theme=customizr&_wpnonce=122b21a5be) never actually updates the theme. I need to go get it and delete the old one and replace it with the new one every time. the theme update worked fine on my tests website. I deleted it, but now in my home page i didnt see the The main menu and all the images. Can you please open a topic in the support forum about this ? We will do our best to help and it will benefit to everyone. Thanks for your understanding and I look forward to reading from you in the forum! Slider not working after update, just showing revolving dots.